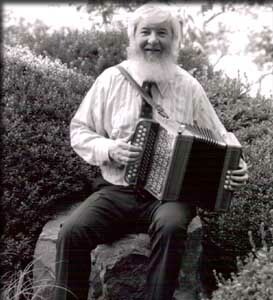 Joe Burke is possibly the most well known musician performing traditional Irish music on the accordion. Joe is from the village of Kilnadeema in East Galway and has inspired many 'box players' to follow the footsteps of the master. Joe burst on the seen in 1955 and is regarded by many as instrumental in the revival of the accordion in traditional Irish music. He has numerous CDs to his name but his first recording in the 50s was released by Gael Linn on the old 78rpm vinyl records and like many of his early CDs is considered a collector's item. Joe has also made many recordings with other artists such as Sean Maguire and Josephine Keegan, Andy McGann and Felix Dolan, Charlie Lennon, Kevin Burke, Brian Conway, to name but a few. For more information on the life and times of Joe visit the Joe Burke website.